I must be the perfect modern employee. In my 20+ years of working life, I have rarely had an office or even a cubicle to call my own, and haven’t particularly wanted or missed one. 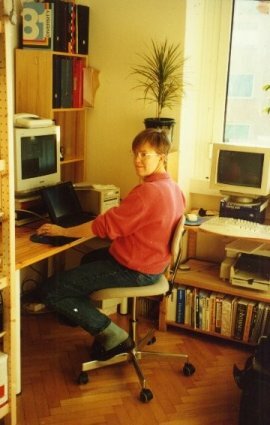 In the three-room apartment that was our home in Milan for 13 years, my workspace (when I wasn’t in a shared office) was a corner of our bedroom. The temporary cubes I was assigned on my visits to Silicon Valley were a comparative luxury! But, even in cramped conditions, working at home had advantages: if my daughter was sick and had to stay home from school, or if public transport was on strike (as happens frequently in Italy) and I couldn’t get to the office, it just didn’t matter. As long as I had a computer and an Internet connection, I could be productive wherever I was. 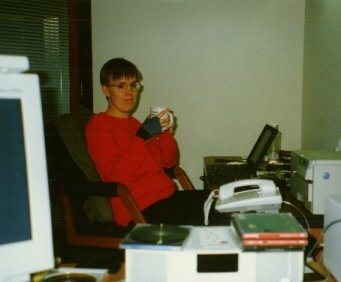 I began travelling extensively for work around 1994, so I always had a laptop (in addition to or instead of a desktop computer), and was accustomed to working anywhere, anytime. 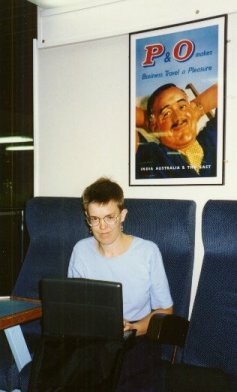 This became a standing family joke: we would stage pictures of me working in unlikely places: on a P&O ferry from Calais to Dover, at the top of a snowy Alp, on a beach recliner in Martinique. I did not actually work in any of those places – I do know how to take a vacation. But not being tied to a desk meant that I could work, when I chose, anywhere in the world. I didn’t have to take vacation time to be present at the obligatory family holidays halfway across Italy: I could spend time with the family and still get my work done. 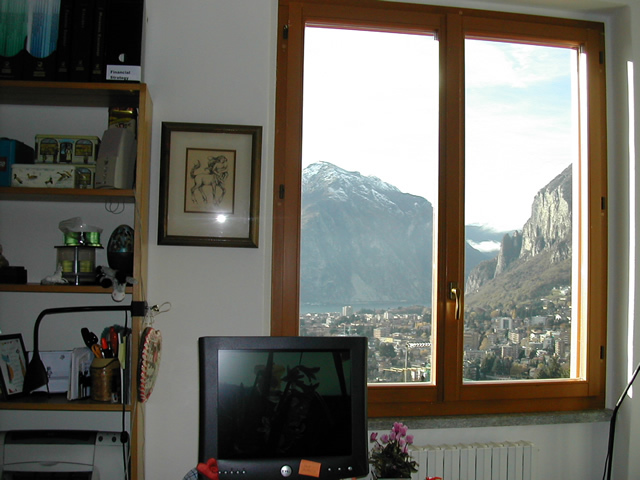 In our new home in Lecco, I have a small home office with a spectacular view – who needs a corporate corner office? But that’s not enough to keep me in one place. My colleagues at Sun don’t much care where I am physically located (and are scattered all over the world themselves, both in Sun offices and at home), so I can pick up my laptop and go wherever I want to. With my Sun badge, I can waltz into any Sun office in the world and use a desk and high-speed Internet – but I don’t have to. Right now I’m in India, visiting my daughter at my old school. Thanks to the hospitality of a classmate, I’m in a comfortable home with a more-than-decent Internet connection. I can even use Skype to keep in touch with my colleagues. The only thing lacking is a desk, but, hey, I’ve still got a lap. And the view ain’t too shabby, either. How about you? Are you ready to give up a cube or office? 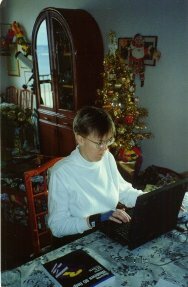 This entry was posted in what I do and tagged technology, what I do on December 5, 2007 by Deirdre Straughan. Due to the job I do I need an office with some structure and an address where the paper can be sent after proofreads. Having said this, this office could be a part of my apartment if I hd room enough, but this would also mean the purchase of very costly hardware (high-quality printers in particular). yet, if my job were different I would really enjoy being able to carry my office in a backpack anywhere I went. I honestly beleive that I could do a better job on a beach recliner in Martinique… Heck! A towel in Liguria would still be better than my semi-subterranean office. A motivated person can work anywhere, anytime, and finally technology supports that. I just wish people would not do their office work while driving down the freeway…I’m serious. But in response to your question, where was the “having it all” option? I love my office, but I equally love being (theoretically) able to plug in anywhere in the world and work or play on my laptop. I am bummed to say that on my recent business trip to the UK combined with vacation in Friuli-Venezia Giulia, my laptop was simply a cinderblock in my suitcase. In the UK, the hotel’s network didn’t work and I couldn’t find a properly working power converter outside our corporate office, so my battery ran out. In FVG, I could charge the battery but could not find a network. I had planned to use my laptop to finalize some arrangements once I arrived, so unfortunately I ended up missing some people and places. Alice, I’m sorry if you took my sunny overstatement as a suggestion that since you can’t do all you work online, you’re not motivated. Your post had not yet appeared when I began writing my post, so I was not addressing your post but rather, Deirdre’s original question re: desk vs. freedom. Of course I was referring to the type of work that can be accomplished online or stored on a laptop. A chef or a home remodeler, no matter how motivated, does not have such latitude. Understood. 🙂 I’ve also spent some years as an editor and tech writer, and I’ve never been able to get fully away from hardcopy. As for my job, i’m a programmer, so location is not so important (when there are no boring meeting to attend). “psychologically” i could leave my “cube” at the office… well, we have large cubes… we call them naves 🙂 . But i have a problem… i hate laptops (maybe it’s just that i didn’t ever used them extensively to learn to love them). I would love things like the Flybook and its touch screen (the main part i hate in laptops is the trackpad) but, maybe, for prolonged sessions it’s too small. I would not travel all around the world… i’m lazy, but sometimes i just dream about being at one of the two public parks near home and be connected (and in one of those two park they are even building a free wifi network just now).